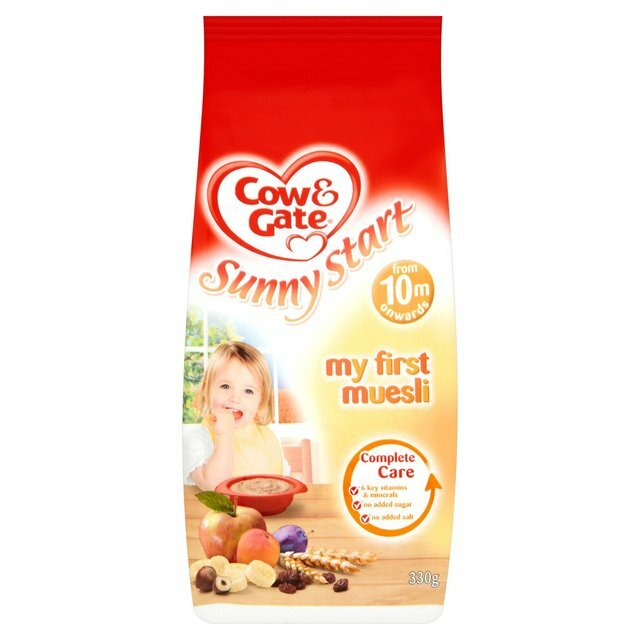 Every Cow & Gate Sunny Start breakfast cereal is carefully tailored to provide 6 key vitamins and minerals and no added sugar or salt, unlike other cereals. 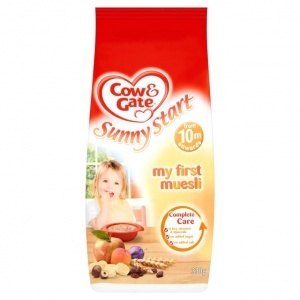 There are no artificial colourings, flavourings or preservatives in any Cow & Gate Sunny Start breakfast cereal, but lots of delicious fruits and grains for a great start to your baby's day. Our 10 month onwards cereals are ideal for your baby at this age, with exciting recipes like real muesli, baby tailored and crunchy pieces ideal for little fingers to hold. ...Cow & Gate Sunny Start is packed full of the right balance of energy, minerals and vitamins in every bowl. Baby-Grade Fruit* (Apple, Raisins, Banana, Apricot, Prunes), Cereals* (Oats*, Wheat, Rice, Millet, Barley, Maize, Rye), Ground Hazelnut, Maltodextrin, Calcium, Vitamins†, Iron, Zinc, †Vitamins: Vitamin C, Niacin, Vitamin E, Pantothenic Acid, Vitamin B6, Thiamin (B1), Vitamin A, Folic Acid, Vitamin D, Biotin, *Prepared with 117g Fruit, 57g Oats, 11g Cereal and 2g Nuts per 100g dry product. Per 100g powder : Energy 1534kJ/367kcal, Fat 5.4g, of which saturates 1g, Carbohydrate 64.7g, of which sugars 18.8g, Fibre 8.4g, Protein 10.1g, Salt 0.075g, Vitamin D1 10µg, Vitamin C 38mg, Thiamin (B1) 0.5mg, Riboflavin (B2) 0.13mg, Niacin (B3) 0.7mg, Folic acid 40µg, Calcium 200mg, Iron 11.5mg, Zinc 5.4mg, *made with 90ml whole milk, *Per 35 cereal made with 90ml whole milk, 1 LRV=(Labeling Reference Value) is a guide to the amount of vitamins and minerals needed per day to meet the requirements of infants and young children. Using a clean bowl and feeding spoon, mix 1 spoon of cereal with 3 spoons of your baby's usual milk and stir. If serving warm, check the temperature of the cereals before serving.